I came upon this postcard I had made maybe 10 years ago, when I was doing a lot of spplique embellishment on shoes. 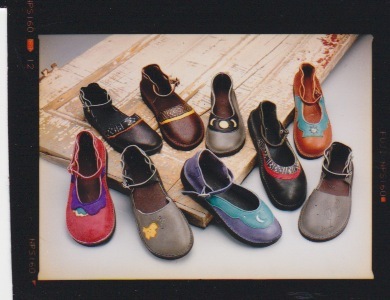 Here’s Mary Janes and dance sandals, each made unique by their colors and designs. I like it so much that I’m using it for my banner! I received a photo of the pair of shoes that was made during the last shoemaking “‘tutorial” (I’ll call it that since I teach one person at a time) I offered, and am sharing it with you. It’s a strange thing, how something like a pleasing line can create such a flow of uplifting brain chemicals – I felt such contentment when I saw the curve of the topline. It seems that the same part of my brain as finds resolution in hearing a beautiful musical chord was stimulated. I have to admit that there was one aspect of these shoes, that the photo doesn’t show, where I wish I had asked Linda to do things differently; we buffed the turned-out edge after cementing the natural rubber sole to the vegetable-tanned leather topsole. The rubber got kind of bunged-up, as we were trying to put a nice shine on the topsole. I wish I had buffed the topsole before attaching the rubber sole, and hopefully will remember to do it that way in the future. 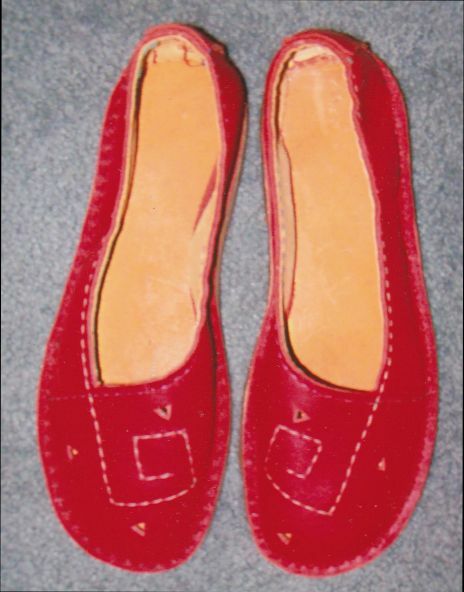 Oh, and she didn’t plan to have little triangular punched holes on her shoes, just the “square spiral”. However, when I was demonstrating the sanding process, I knicked a little surface on the toe. Using the attitude that I was taught in a workshop of “don’t call it a mistake, make it a feature”, we added the triangles, and for me, the error definately transformed into a “feature”! Well, you might think twice about coming to me for a shoemaking tutorial, as I am always learning (and re-learning) and experimenting right along with the student. If that’s within your comfort zone, I’m the teacher for you! James Roberts of Melbourne, Australia makes footwear and leather goods by hand, using methods and tools much the same to those used a hundred years ago. His shoes start at $800 AUD (about $790 USD), with boots and custom work going much higher—and he has a waiting list of six months plus. Numerous other leather-workers ply their trade on Etsy.com’s online marketplace, crafting custom shoes, boots, and bags. There, a pair of custom-made men’s or women’s shoes can command $500 a pair, and bags draw $100 on up. James uses all leather for his shoes’ uppers, linings and soles and stiffeners, he hand-sews the shoes, and he dyes his own leather. “A day in the workshop is hard work. I usually have a few different tasks that I aim to get done that day. Sometimes it can take all day hand- stitching the soles on.” He spends anywhere from 40-70 hours making each pair.